The President of the network is not on board with Calculon’s return to All My Circuits because they are targeting a hip, new demographic. To add insult to injury, Calculon’s star on the Hollywood Walk of Fame has been replaced with yet another star for Robert Wagner. So, Calculon plans a career resurrection with the one-man show he wrote by himself for himself.The reviews are not pretty. “Worst Play In History.” “Calculon Dies For Second Time.” “Theater To Be Demolished To Remove Stink Of New Play.” Luckily, Calculon is immensely cheered up by dramatic pauses. Fry needs him back on television so that they can watch and not talk to each other, but Calculon is too dismayed over the reviews. And it moves Leela to tears, which is the first time she didn’t roll her eye at his performance.Leela concocts a plan to have a modest and sincere Calculon audition for a bit part on All My Circuits in disguise under the name Mr. Ben Derisgreat. But, the casting agents want him to audition for the role of…Calculon. His acting is crap, and the director hates it, and Leela tells it to him straight—they should’ve left him dead because he can’t possibly do the scene. But it was all just a ruse to humble Calculon before the second take. And it worked. Unfortunately, he is crushed by the lighting equipment after just one scene, ends up back in Robot Hell, and gets a posthumous star on the Walk Of Fame. 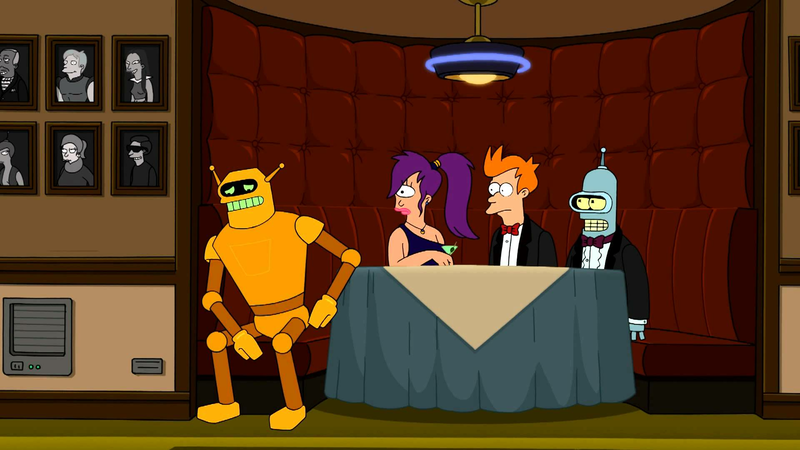 This entry was posted in Futurama, Recaps and tagged Bender, Calculon, Dramatic....Pause, Fry, Mr. Ben Derisgreat, Robert Wagner, Robot Hell, The Bard's Quill by misslinda. Bookmark the permalink.